I love Beef Stroganoff, it’s the ultimate comfort food! 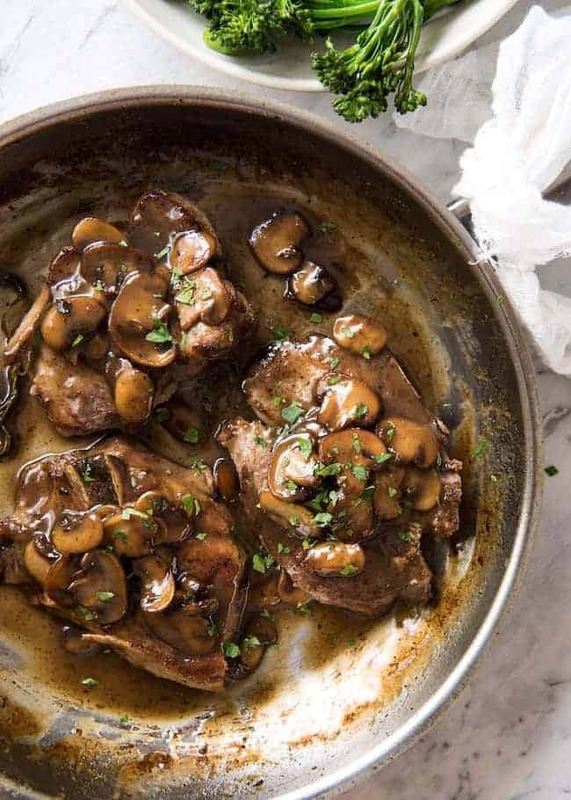 Tender beef, mushrooms and onions roasted to perfection and smothered in a rich flavorful sauce. 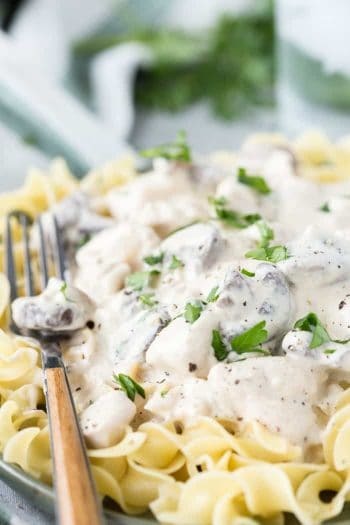 This casserole takes a traditional stroganoff to the next level by baking the tender noodles in a sour cream gravy sauce. The noodles soak in all of the delicious flavor for a dish you literally cannot resist. 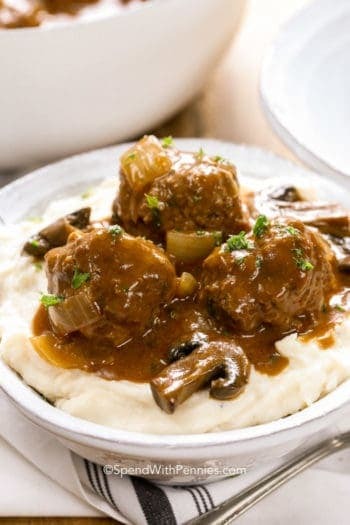 I am so excited to have partnered with McCormick to bring you this belly warming recipe. 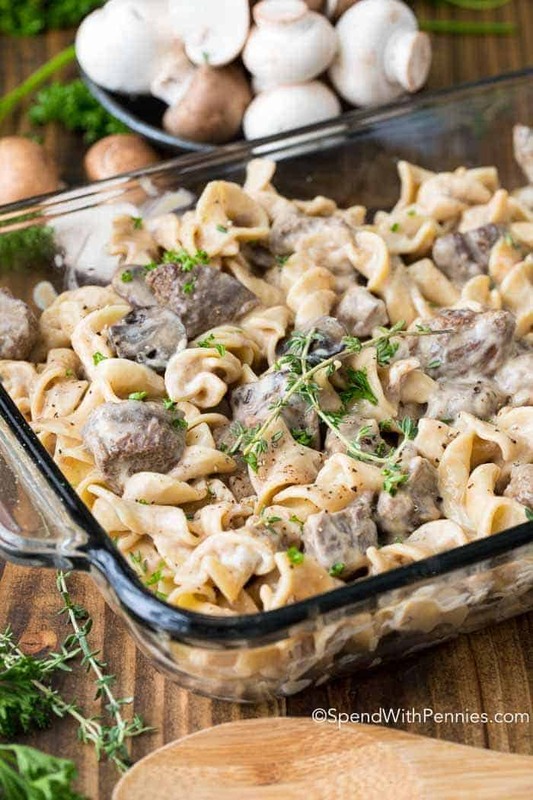 Beef stroganoff is often made with sirloin (or with ground beef) and as many times as I’ve tried it, I never find the beef is tender enough. I set out to make a beef stroganoff that was incredibly tender while making sure it was simple to make and full of flavor. This recipe turns inexpensive stewing beef incredibly tender by roasting it low and slow. In return this dish is absolutely luscious and so full of flavor and the beef literally melts in your mouth! First pieces of stewing beef are seared in a very hot pan until they have a nice brown crust to add amazing flavor. You don’t want it just browned, you want a nice crust to really seal the beef before roasting. 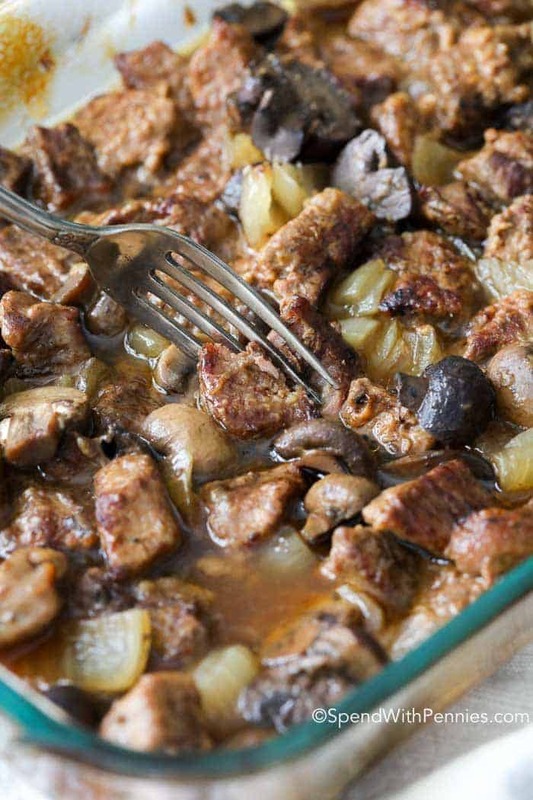 The great thing is that slowly roasting beef with onions and mushrooms (and just a touch of broth) not only creates the most tender meat but the mushrooms and onions caramelize leaving the best flavor infused in every bite of this stroganoff! The secret to this recipe, though, is the simple, two-ingredient sauce that gets added with the noodles for the last 15 minutes of roasting. 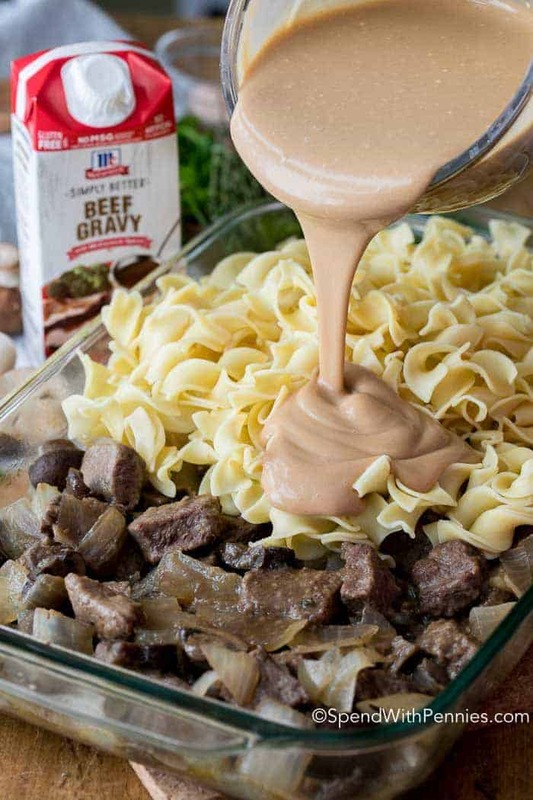 The sauce for this beef stroganoff doesn’t have to be fussy and because the ingredients have such amazing flavors on their own. I combined McCormick Simply Better Gravy with sour cream for the most perfect sauce. 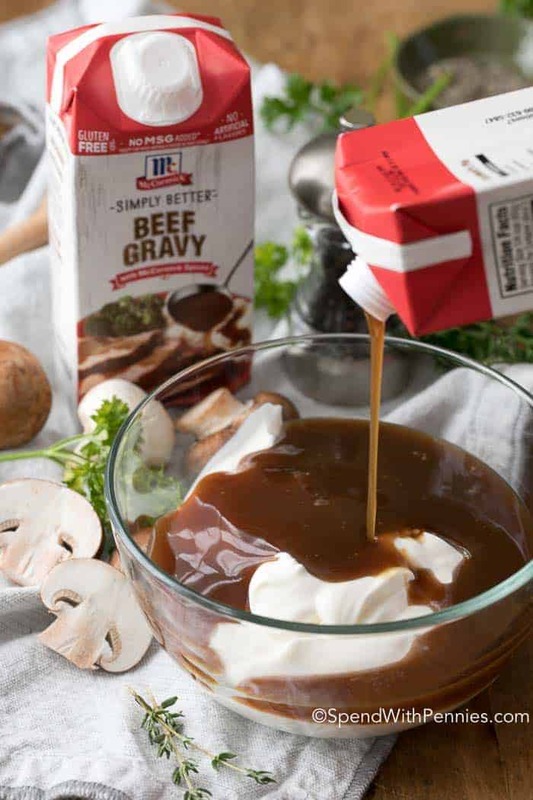 I love the Simply Better Gravy not only because it is delicious, but also because it tastes so close to homemade. 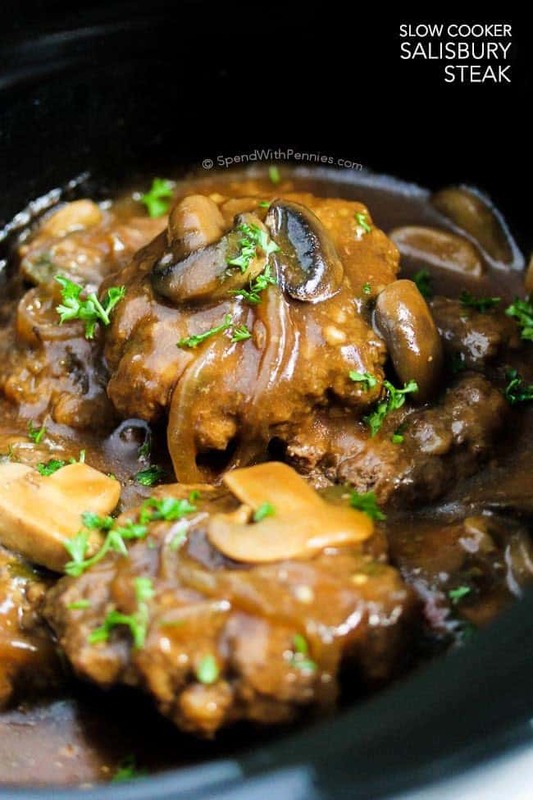 Since this beef stroganoff casserole contains fresh ingredients like mushrooms and onions, I love that this gravy contains no artificial flavors while still having the perfect consistency and loads of flavor! 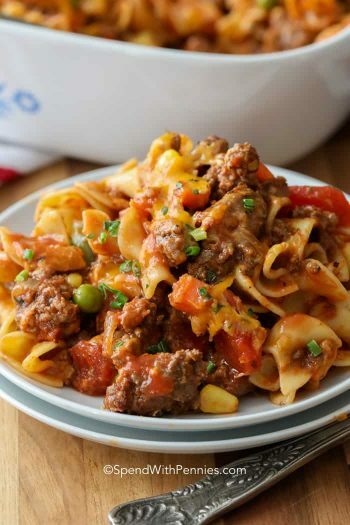 You may wonder why this is a casserole instead of just dishing up the beef mixture over noodles… the answer is MORE FLAVOR! The noodles are slightly undercooked (so they don’t get mushy) and then tossed with the tender beef mixture and of course the rich sour cream and gravy. 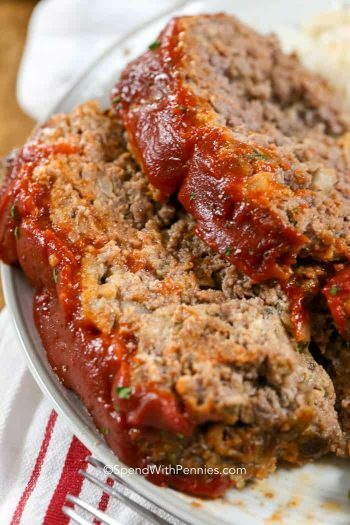 By baking this until hot and bubbly, the rich sauce is infused into the noodles making sure every single bite is crazy delicious! 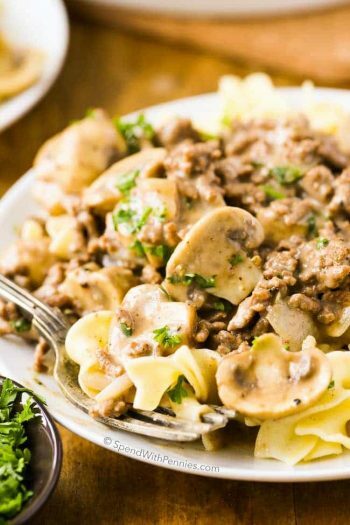 If you don’t happen to have stewing beef (or if you just prefer ground beef), you can certainly use ground beef in this stroganoff recipe. Simply roast the mushrooms and onions (reduce the broth to 1/4 cup) for about 45 minutes or until tender. Stir in cooked ground beef, the remaining ingredients and bake as directed! It also works perfectly with leftover roast beef, chopped leftover steak or even store bought pre-cooked roast! If you like a buttery crumb topping on your casseroles, it works perfectly on this recipe! I make a simple garlic buttered Panko topping by combining 1/2 cup Panko bread crumbs, 1 tablespoon fresh parsley, 1/2 teaspoon garlic powder and 1 1/2 tablespoons melted butter. Sprinkle over the casserole just before baking. The perfect finish to this dish! Find McCormick’s Simply Better Gravy in your area here. In 9×13 inch pan combine beef, onions, mushrooms, thyme and beef broth Cover tightly with tin foil and bake for 2 hours or until beef is fork tender. Meanwhile, combine the sour cream,Simply Better Gravy and cornstarch in small bowl and set aside. I am so excited to have partnered with McCormick to bring you this belly warming recipe. While I was compensated for this post, all thoughts and opinions (and this yummy recipe) are my own. Working with the brands I love allows me to keep bringing you the great recipes you love! When my dad was in the Army he brought home a Russian recipe from Saudi Arabia. They used round steak and the only thing he couldn’t make were the very thin, crispy fried potatoes they ate the dish over – so he substituted potatoe sticks! The gravy is flour, sour cream, beef bouillon cubes and some Worcestershire. That’s what I grew up on so didn’t know differently until the first time I ordered it in a restaurant and was surprised with beef with brown gravy over flat noodles! I’m looking forward to trying your recipe to see how close it is to mine. But no matter which way someone makes it, stroganoff is delicious! I didn’t even know McCormicks made that gravy in a container, so yay – one step kicked to the curb. Now I’m off to check out the unstuffed cabbage roll casserole! 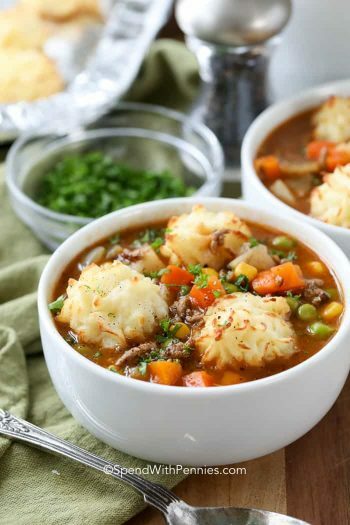 Then your beef stew recipe – I just made some today (and used McCormick’s beef stew mix in a package as the thickener. Enjoy Nan, what a great recipe to have from your dad, I can’t wait to hear how you like this version! This recipe sounds awesome and I love beef stroganoff. I’m having a family dinner with nine people. Can this be doubled? Yes, this can be doubled. It be prepared or cooked ahead of time and reheated? I think it will reheat perfectly. As for preparing it ahead of time, I have only made this recipe as written so I can’t say for sure. Let us know how it works out if you try that. Can you use red wine for beef broth? That sounds like a delicious substitution! Making this tonight! But just noticed…. The header says cooking time is about an hour. The directions say bake the meat for 2 hours. Which is it?? The meat should be baked for 2 hours or until tender. Total cooking time will be around 2 1/2 hours total. Enjoy! Made this for dinner tonight and honestly it’s to die for, it’s just that good! Going on a regular rotation at our home! When do you add the Tyme.? The thyme is added to the beef in step 5. I’ve updated the post, thank you Lynne!